The fact that the mobile Internet is becoming increasingly important is once again illustrated by a study performed last June by MeMo² among 800 Dutch teens and young adults. This study showed that all forms of Internet and mobile telephony have become a daily basic need for today’s youth. Almost half of the respondents would rather go without eating for an entire day than be deprived of Internet for a month. Young people use their mobile or laptop for all sorts of communication, from flirting to arguing. What ‘older people’ experience as impersonal communication has become a natural means of communication to young people. Consequently, nearly half of them get itchy if they cannot check their e-mail. One third of respondents have also been known to hang around in chat rooms for too long, which resulted in oversleeping, sleep deprivation or being late for an appointment. 85% of young people want to have their mobile handy at all times and nearly two-thirds of youngsters only switch off their mobile when its battery is empty! In conclusion: to the new generation, the mobile Internet is the future. 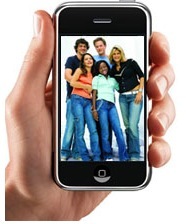 Chats, social networks and VoIP on the mobile Internet are young people’s preferred communication channels. Therefore, advertisers would best use these channels to reach this age group. And what about you? Is your website adapted to mobile users? Launching a new website… risky business?